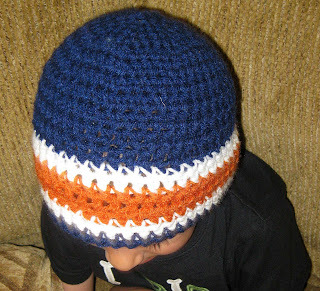 Months ago, I promised Gracie and Luke Chicago Bears beanies so that they could be like their Dad on game day. 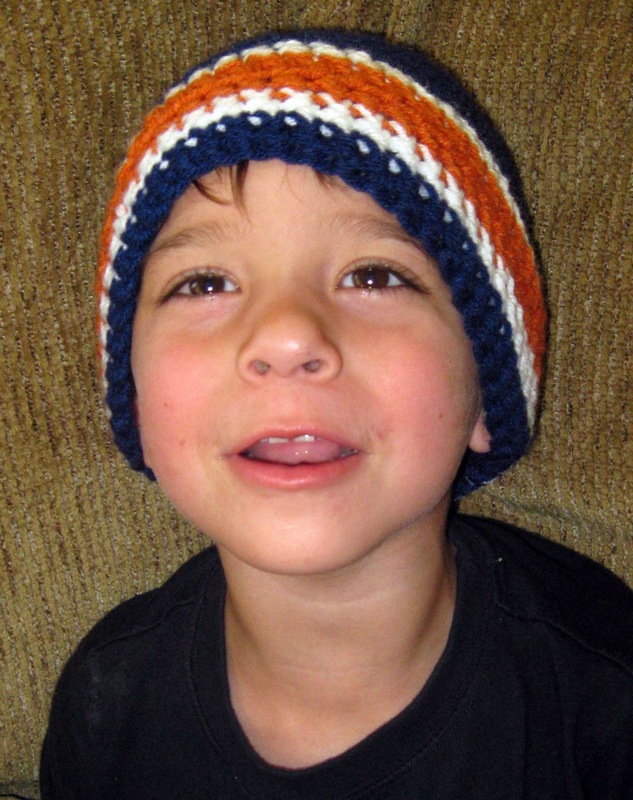 Monday, Luke came to me and said, "Mommy, you promised to make me a hat. When can I have it?" Mom fail. I've made a gajillion scarves and hats for other people, but I haven't had time to make hats for my own children. So, I set out to find a pattern that would fit Luke's head and would work well with the colors on the Bears' away jersey. 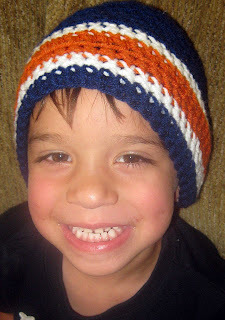 Monday, I finally had time to focus on his hat and found this pattern to help me with it. It's a fine hat. Easy pattern, for a boy's hat. Here's the thing. The pattern calls for double crochets at one point and I wasn't liking the way the hat was coming out. I tore out about 5 rows of stitches and started again with half double crochets. I loved the way it looked. To achieve the effect of the Bears' jersey stripes, I switched to single crochets for the white stripes and back to half doubles for the orange stripe. Begin with Navy Blue yarn. Rnd 1: Ch 1, 11 sc in ring; join -- 12 sts. Rnd 2: Ch 1, sc in same st as joining, 2 sc in each st around; join -- 24 sts. Rnd 3: Ch 1, * 2 sc in next st, sc in next st. Repeat from * around; join - 36 sts. Rnd 4: Ch 1, sc in next st, * 2 sc in next st, sc in next 2 sts; repeat from * around; join – 48 sts. Rnds 5-11: Ch 2, hdc in each st around; join. Change color to white yarn. Rnds 14-15: Ch 2, sc in each st around; join. Change color to orange yarn (I used "Carrot" by Red Heart). Rnds 16-17: Ch 2, hdc in each st around; join. Rnds 18-19: Ch 2, sc in each st around; join. 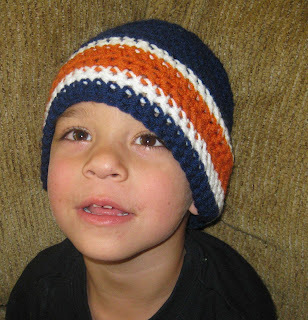 Change color to navy blue yarn. Rnds 20-21: Ch 2, sc in each st around; join. Luke loves his hat and wants to wear it all the time! Now, he's just like his Daddy!